At PowerProducts Systems, our Services Department aims to ensure that our customers receive the most comprehensive services and support they need to keep their generators running in top condition. There is scarcely an engine or genset problem that our technicians haven’t seen and remedied. No matter what our customers need, PowerProducts is committed to providing first-rate services consistently and quickly with the latest power systems technologies. Our plans include inspecting and testing not just your generator set but also ATS, as well as other annually recommended maintenance procedures. For your convenience you may print out and fill in our Planned Maintenance Order Form or the Planned Maintenance Agreement in advance and email/ fax it to your PowerProducts Sales Representative. 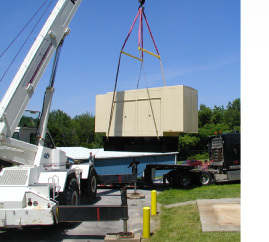 Company owned Load Bank Equipment with Trained Technicians Available. For more information on load bank testing, contact a sales representative.